Why buy from Spartec LLC? 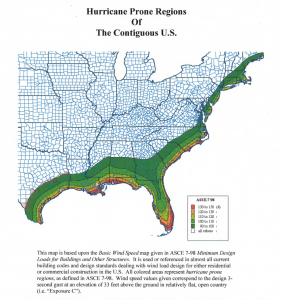 There are five designated high wind zones along the east coast from Maine to Florida and along the southern coast line of Texas, Louisiana, Mississippi and Alabama that are known to be prone, to some degree, for hurricanes and high winds. Houses built in these zones must meet the structural integrity of sufficient strength to withstand appropriate wind levels. 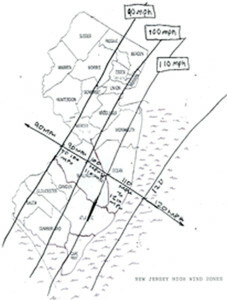 The zones vary from 90 MPH to 150 MPH with the lowest being in the New England area and the highest being in southern Florida and coastal areas of some southern states. Each zone requires a specific level of high wind protection and must meet minimum design loads for buildings and other structures as called for in ASCA 7-98. Procedures to meed the force of high winds usually involve the installation of devices to secure the house or other structure to the foundation and installing approved hurricane straps from companies like Simpson Strong-Tie and others. These five zones are not specifically defined and interested parties should consult with their local Department of Community Affairs for help in determining the exact boundary line between zones. It is recommended that if the property sits right on the boundary line between two zones, that the higher zone requirements take precedence.